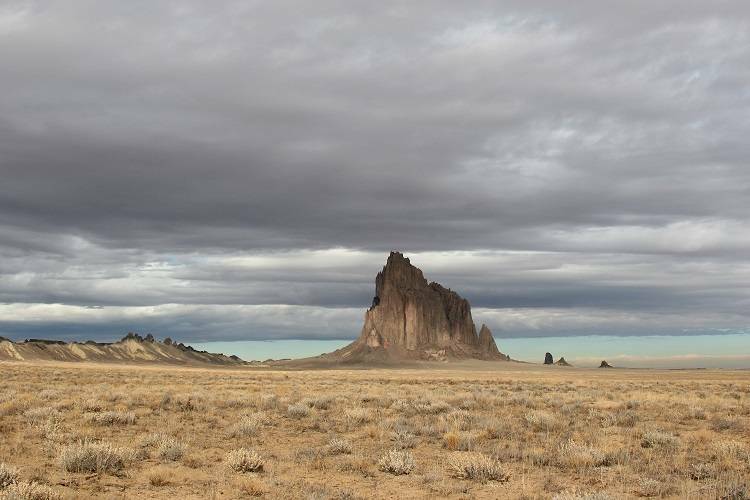 Shiprock Pinnacle is visible 30 to 50 miles from the peak, in almost every direction. This sacred landmark is located south of the community of Shiprock on Hwy. 491. Best viewing is west of Farmington along Hwy. 64 or south of Shiprock on Hwy. 491. To reach the base of Shiprock for a self-guided tour and up-close view turn west off Hwy. 491 onto Red Valley Road / Route 5, south of the formation. Route 5 actually passes through the south dike and offers stunning views and connects with multiple dirt roads that will lead you to the base of Shiprock peak. Keep in mind that these roads intersect private property. Be respectful of the people and land you encounter and watch for cattle and horses.